You get advice everywhere to be prepared in case of emergencies. This is even true for your home plumbing. Plumbing emergencies can pop up in an instant and if you’re not prepared it might lead to your house being flooded with water. If this happens to your home, the cost to fix it would be enormous. Preparation becomes even more important. It will lessen the likelihood of you experiencing a huge plumbing emergency. There is less stress on your part and you avoid paying a huge bill for damages. Learning to be prepared for a plumbing emergency need a bit of research. You can read about the best practices to keep your plumbing functioning properly. Have the phone number of your favorite plumber in Singapore in reach in case an incident happens. You can also buy a few tools that could help you with these types of emergencies. Most homes have a plunger kept safe because it’s a tool that most use for a plumbing problem especially one that’s found in the toilet. A plunger comes in two types which are the cup and the flange and both have different uses. A cup plunger is the most common because this is the plunger homeowners whip out to clear drains and toilet sinks or any flat surface that the plunger can be placed on. Flange plungers are used on toilets because the cup has some added rubber on top. The rubber acts as a seal to be able to use it on a curved surface such as the toilet or curved sink. Keeping both inside your home will save you problems with clogging. These tools are easy to whip out when you encounter a problem with your plumbing. Both have their specific uses which means you solve most types of plumbing problems. This is a common item found in most kinds of repairs. Even in plumbing, having a duct tape kept away will be useful. It can be used to seal leaks and blocking water from getting out of the pipe. It provides a temporary fix because it’s water-resistant and you can easily remove it for when you hire a plumber to fix the problem permanently. Wrenches are used to loosen or tighten items that other tools would not be able to grip tightly. The serrated jaws are responsible for it’s ability to hold. Use a pipe wrench to adjust your pipe when it needs tweaking. These tools are especially made for pipes. You can remove, replace, loosen, or tighten your pipes using these tools. You can find them in your local hardware store. These can also be stored easily, so you can get it when you need it. 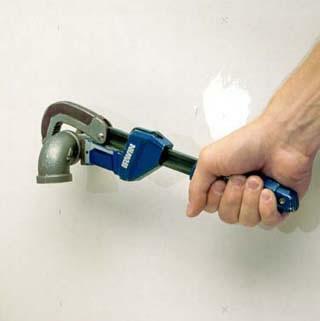 These are two tools that are used together to solve common plumbing problems. It is mainly used to loosen up the clogging inside your drains. They are used when a plunger can’t do the job. You can use it to directly hook up the clog materials to try to loosen it up. Both work on toilets, sinks, showers, and tubs.